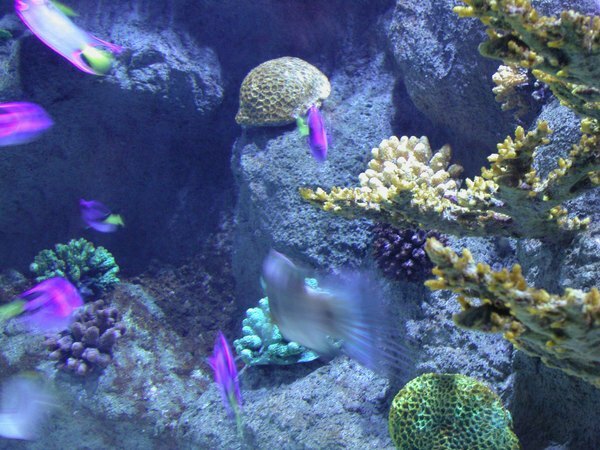 Reef aquariums feature both fish and invertebrates like coral. You can use calcium hydroxide to raise the pH, alkalinity and calcium ion levels of marine aquariums. In saltwater fish tanks, these chemical parameters tend to drop, and you need to buffer them to prevent harm to your fish and invertebrates. Calcium hydroxide can be a useful tool for this. Marine organisms have adapted to very consistent conditions, and they do not adapt well to changing water parameters or less-than-ideal conditions. 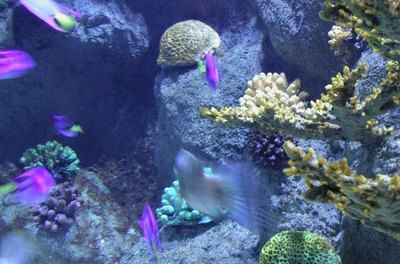 In marine aquariums, protein skimming and evaporation can reduce the amount of calcium ions in the water, which also lower the pH and alkalinity of the water. In reef tanks, corals and other invertebrates can compound this problem by absorbing calcium from the water to build the hard support structures in their bodies. So in saltwater aquariums, you need to replace this lost calcium somehow. Calcium hydroxide is one of several methods to do this. Calcium hydroxide, also called kalwasser in the aquarium trade, needs preparation before you add it to the aquarium. Mix the calcium hydroxide with purified water, either RO water or distilled, before adding it. You also need to add the calcium hydroxide in the early morning, before the aquarium lights turn on, since this will help with pH issues. Add a few drops at a time, then test the calcium ion levels and pH about an hour later to make sure you've achieved the desired result. It will take some trial-and-error to figure out how much you need to add and how often. Calcium hydroxide itself has a very high pH. Additionally, it can effect alkalinity and calcium ion levels in addition to pH, so you need to monitor the water chemistry carefully when using it. Sudden changes in pH, even changes toward optimal conditions, can stress and even kill both fish and invertebrates. While calcium hydroxide can rapidly fix issues with pH and calcium levels, it can also overshoot and cause problems just as quickly. Using calcium hydroxide requires monitoring of pH, alkalinity and calcium ion levels. When you're first determining how much you need to add and how often, you should test every time you add calcium hydroxide. Once you establish a routine, you can cut back on testing -- somewhat. You should test pH and alkalinity weekly, and calcium ion levels monthly. However, if you see issues with your pH, or your fish or invertebrates seem distressed, you should immediately check all of these water parameters. What Is an Aquarium Calcium Reactor For? What Is the Desired Calcium Level for an Aquarium?